It's that time of the year again where every brand is producing amazing gift sets for the Christmas season and like many of you, I have my eye on a few that are heading on my wishlist. This week I wanted to share with you Beauty Bay's amazing new collection. They have introduced 13 new beauty bags that are pre packed full of goodies. Each bag has a variety of makeup that is great to give as gifts or even buy for yourself! All the sets come with a cute makeup pouch and an instruction card that gives some tips and tricks on how to use the goodies inside! The bags start at a price of £18. There are 5 options that you can choose from, each with a value of over £20. This collection is filled with neutral eyeshadows all from Makeup Geek. It includes the shadows Beaches & Cream, Latte, Cocoa Bear and a foiled eyeshadow Legend. I have all but Legend and I have to say these are staples in my collection. If you know someone that loves their neutrals then this is a good bag to get! The total value of this bag is worth over £25 - saving of £7. If you know someone who loves their neutrals but also likes to glam it up a bit, then this bag is perfect. This one has two Makeup Geek Foiled shadows in Mesmerised and Showtime. Both are in the brown shades but look absolutely stunning. This also comes with a waterproof matte liquid lipstick by LA Splash in the shade Aphrodite which is a metallic blushed beige. This is worth over £27 - saving of £9. Here we have another all Makeup Geek eyeshadow set, but this time the shades are more in the green family. We have Venom, Corrupt, Moondust and a foiled shadow in Jester. Despite these being mainly green shades, they do look really wearable. Plus corrupt is my favourite black eyeshadow. The total value of this set is over £25 - saving of £7. If you have someone who likes that polished, everyday look then this has all the essentials you need. Again, a Makeup Geek filled set with my personal favourites: Cocoa Bear, Corrupt, Creme Brulee and Shimma Shimma. All of these are my most used shadows by Makeup Geek! Total value of this is £22 - saving of £4. This is the last set at £18 and it's a set of Makeup Geek eyeshadows that are in the berry-toned family! There's Cinderella, Bitten, Americano and a foiled shadow in the shade Showtime. This is a perfect Autumnal/Christmassy set and the shades aren't too overpowering. The total of this bag is £25 - saving of £7. We now go into the second band of the sets which have a few different products in. Ok we're starting to get a bit more variety now. Here we have two Makeup Geek eyeshadows in Cosmopolitan and Bitten, Gerard Cosmetics Hydra Matte in Iced Mocha which is a plum purple shade ad finally an Eyeko Mini Eye do Liquid Liner, which I believe is in Black. The full value of this is over £29 - saving of £9. Stepping away from the eyes, we have a full lip kit here. There's the Gerard Cosmetics lipstick in Underground, a Hydra Matte Liquid Lipstick in Gravity and a Lip Pencil in Exstasy. All the colours compliment each other really well. The lipsticks by Gerard Cosmetics are really good quality so I'd definitely recommend this set. Total of this bag is over £32 - saving of £7. Another lip kit, this time with more pinky shades. Again, they are all Gerard Cosmetics products. It includes, my personal favourite lipstick 1995, the Hydra Matte liquid lipstick in Serenity and a lip pencil in the shade Cher. The total of this bag is over £42 - saving of £17. This is the highest band of bags and they all tend to have a few more pieces in! If you know someone who is a fan of liquid lipsticks, then this is perfect. It includes LA Splash Lip Couture in Ghoulish which is a grey toned brown, Gerard Cosmetics Hydra Matte liquid lipstick in Serenity which is a baby pink and finally a Coloured Raine Matte Liquid Paint in the shade Cherry Blossom. This bag is worth over £36 - saving of £6. If you're not sure if someone likes lip products over eye products, then why not get something with a bit of both? This bag comes with Makeup Geeks eyeshadows in Cosmopolitan and Bitten, an Eyeko Eye Do mini liquid eyeliner, Stila's Huge Extreme Lash Mascara, Kevyn Aucoin The Flesh Tone lip pencil in Medium, and finally Gerard Cosmetics' hydra matte liquid lipstick in Iced Mocha and all day setting spray in Peach. The total of this bag is a whopping £70, giving you a saving of £25! We have two beauty tools in this set! The original Beauty Blender and the Morphe Buffer brush in M439. Then we have Makeup Geeks eyeshadow in Bitten, Anastasia Beverly Hills brow wiz in Medium Brown, an Eyeko mini Eye Do Liquid Liner and a Gerard Cosmetics Hydra Matte liquid lipstick in 1995. This totals to over £75 - with a saving of £15. These bags are perfect gift ideas, whether it's for your friends, your family, your partner or even yourself! There's something for everyone! Which one is your favourite! 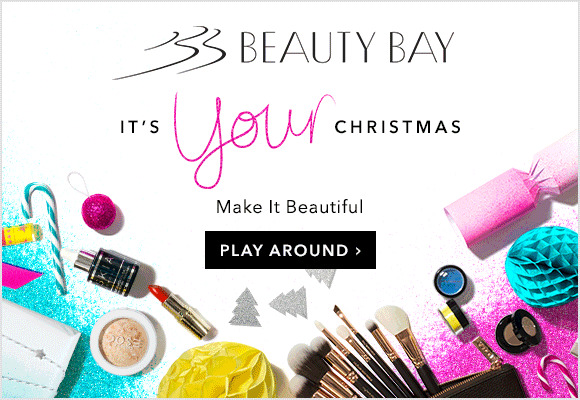 There are other really great gifts on Christmas Shop at Beauty Bay Bay too!